Simon Willey is an experienced master thatcher based in Wellington Somerset. Simon Willey has been thatching for over 22 years providing a reputable service with high quality craftsmanship. 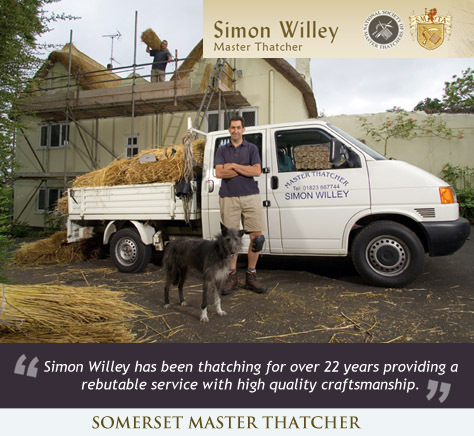 Simon is a member of the Somerset Master Thatcher Association and the National Society of Master Thatchers. As well as thatching services, Simon also offers a number of building services. Simon Willey can offer a wide range of services from traditional thatching to new builds and barn conversions. Slate/tile roofing and chimney rebuilds by associated craftsmen can also be provided.